It’s estimated that there are between 8 and 20 billion potentially habitable Earth-like worlds within our galaxy alone. Those are just the ones that orbit Sun-like stars. If you add in stars like red dwarfs, the number of potentially habitable planets rises to over 40 billion. Of course that is just the ones within our galaxy. There are about 100 billion galaxies within the observable universe. That’s a lot of potential for other intelligent species, but so far none of them have made contact with us. Just why is a bit of a mystery. One solution is that no other intelligent species has contacted us because there are no other intelligent species besides ours. It is possible that the appearance of intelligent life in the universe is so extraordinarily rare that we are the only such species in the entire universe. It’s also possible that intelligent life is rather common, and there is some other reason that motivates them to avoid us. Either way, it would be helpful if we had an idea of just how likely or rare intelligent life actually is. One way to estimate this is through an equation known as the Drake equation. The Drake equation was originally proposed at the first SETI conference by Frank Drake in 1961 as a way to stimulate discussion. Drake did not intend it as a prediction of the correct value, but more as a “what if” to consider. The equation itself is basically a product of the rate at which stars form in our galaxy, how many stars have planets, how many planets they typically have, what fraction are habitable, what fraction of habitable planets form life, how many form intelligent life, then civilizations, and how long those civilizations last. When Drake first proposed the equation, most of the values in the equation were largely unknown. We now have data on several of them. We know that about 7 new stars form in our galaxy each year, virtually all main sequence stars are likely to have planets, and they likely have more than 1 planet. There are about 60 billion Sun-like stars in our galaxy, and it’s estimated that about 15% – 30% of those stars have planets in their habitable zone. From that we get a value of 8 to 20 billion potentially habitable Earth-like planets. The rest of the Drake equation remains pretty speculative. If we suppose there are 10 billion potential Earths, how many of them actually have life? We only have one example of life arising on a planet, and drawing conclusions from a sample size of 1 is iffy at best. But if we assume Earth is fairly typical, then perhaps 10% of these worlds could have possessed life for at least a billion years. That would mean there is life on about 100 million planets. Of these, what fraction will give rise to an intelligent species? Intelligent life arose on Earth, so it’s possible that most planets with life will give rise to intelligence. Or it could be that intelligence is just a fluke. Again, we only have one example. 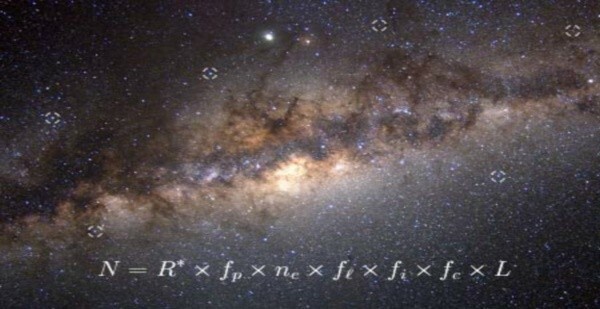 This is perhaps the most speculative aspect of the Drake equation. Estimates range from nearly 100% to almost none. Of those with intelligent life, how many can communicate across the stars? Again, it’s anybody’s guess. So there could be as many as 100 million civilizations, or as few as 1. Carl Sagan saw the Drake equation as a cautionary tale. Credit: Cosmos. The last part of the equation is about how robust civilizations are. When they arise do they last for a million years, or do they collapse within centuries? Our own civilization is relatively young. We’ve only had the potential to communicate across stellar distances for a few decades. How much longer will our civilization last? That’s a good question. Carl Sagan saw the lack of communication with other intelligent species as a cautionary tale. If upwards of 100 million planets have life, and the rise of intelligent life is common, then the reason we haven’t heard from our alien neighbors could be because civilizations are fragile. Perhaps just as they develop the tools to reach the stars they also develop the tools of their annihilation. Perhaps we should view the silent stars not as a mystery, but as a warning. For now it is still largely speculation. 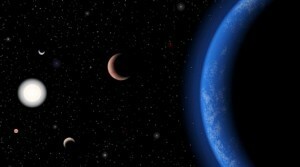 Planets are common, and potentially habitable planets seem to be common, but we just don’t have any hard evidence for more than that. One thing, however is certain. Either we are alone in the universe, or we are not. Either case is deeply profound. Does a planet need to have a moon (having considerable mass) to stabilize its orbit?? so that it can prevent the planet from tilting from its axis?? therefore maintaing constant temperatures for life evolution?? i will be pleased if you reply me. We don’t know. In our case we have a moon, but maybe that isn’t necessary. Has anybody considered that aliens might be very advanced and sensible beings and that being so, they might well regard the human race as the football hooligans/lager louts of the universe and might be hiding their presence from us until we either wipe ourselves out or mature. It seems more likely to me that they’re just too far away to have made contact with us. We only discovered radio communication 130 years ago, so it’s a bit of a dramatic leap to assume that another civilisation would have developed the same technology (it’s not like we’re looking for other types) hundreds of thousands of years ago. long enough to get an answer….Only time has the answer….Over population is our worst enemy…..
After looking at the Drake Equation and considering all of the “if”s in it. The assumptions are fairly broad in that there are several that may not even apply. When you consider that the dinosaurs lived for several millions of years – successfully, there is no reason to assume that another planet had a life-altering event like Chixilub that wiped them out, to allow rise of an intelligent species. Had the dinosaurs NOT been wiped out, would they still be the dominant species? They were successful as they were – no need for “intelligence” and possessing technology. It’s equally plausible that there a all those millions of worlds with nothing but complex, but not-civilised life. Consider the dolphins and whales… they’re intelligent, as far as we can tell, and may not even realize there are stars out there, let alone there may be other worlds. Then, when you add the Fermi Paradox, the fact we don’t see any signs of other worlds is that they either ended before technology, because of technology, they shun technology or their technology (radio) hasn’t reached us yet. There was the discussion a while ago about the idea that we’re not alone, but we are the first. A pretty deep subject all its own.